It is said that in Assam, there is every likelihood that among the first sounds a newborn hears would be a Bhupen Hazarika song. I first met the legend when I was around ten, but much before that I knew him as a near god-like figure. His unique, deep baritone voice and his easy-on-the-ear compositions, which quite often culled out finer nuances of classical ragas and the huge variety of folk music of the Northeast, were already deeply ingrained in my subconscious. It was much later that his songs—the meaning of his words and the mood they evoked—acquired deeper meaning and significance for me. In the late ’70s, we knew him from his photographs in newspapers and magazines, each with the trademark Nepali cap on his head—reportedly a present from the king of Nepal. And of course, from his voice that almost every single day wafted in from the local All India Radio station. So, there was no scope for confusion when I saw him the first time, sitting in the living room of our neighbour Nirode Chaudhury, one of the greatest Assamese writers whose short story had a couple of years before been turned into the classic Assamese film Chameli Memsab (which, incidentally, also got Hazarika the best music director’s honour at the National Film Awards in 1975). When Chaudhury, whom I used to fondly call ‘mama’, introduced me to Hazarika, he turned and started talking to me and it went on for quite some time. Later, I realised that he was not just being gracious to a kid. That was just the way he was. He would have time for every person who would approach him. And this trait never changed even when his health began deteriorating after a stroke he suffered during the Rongali Bihu (Assamese new year) celebrations in Guwahati in 2006. His natural instinct for making everyone feel at home, combined with his innate capacity to document society through his creative work, made him connect instantly, both with intellectuals as well as the illiterate. Hazarika’s genius was not only in being a composer-lyricist-singer-filmmaker but also a journalist-author-painter-politician (having served one term in the Assam assembly as an independent legislator in the late 1960s and making a failed bid as a BJP candidate in the Lok Sabha elections much later). With his left-leaning idealism (something that started changing after the Chinese aggression in 1962), which saw him become a close associate of the likes of Salil Chowdhury, Balraj Sahni and many others in the Indian People’s Theatre Association, Hazarika used his art as a medium to reflect society’s ills and the concerns of the downtrodden. It was almost with a missionary zeal that he wrote songs capturing almost every important social and political development of Northeast India, from the Second World War to the years of ULFA insurgency. Hazarika was encouraged to write as a child by cultural icon Jyotiprasad Agarwalla. He wrote his first song as a seven-year old, its deeply earnest lyrics yearning for the rebirth of the 15th century social reformer Saint Srimanta Sankardev to cure society of its ills. A born humanist, Hazarika’s iconic songs have been about the loss of innocence in mankind. Through songs like Bistirna Parore (later translated into Bengali and Hindi as Ganga Boicho Keno/Ganga Behti Ho Kyon), in which he remonstrated against his beloved Brahmaputra for flowing silently despite all the inhumanity along its banks, or Manuhe Manuhor Baabe, which spoke about the need for compassion. 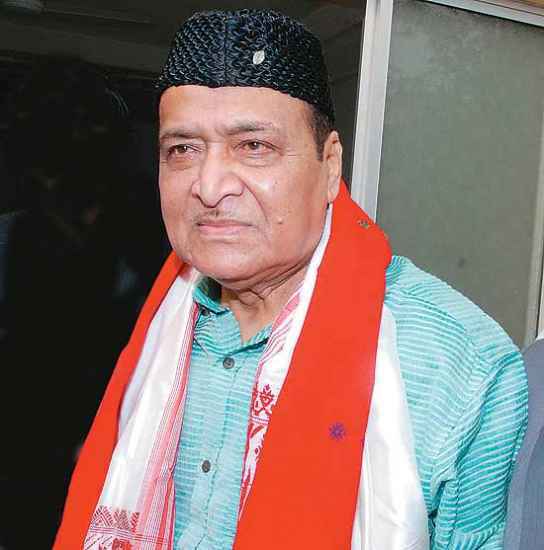 Hazarika espoused universal brotherhood all his life, much like his friend and inspiration, American civil rights activist and singer Paul Robeson. Even in his films, one sees the same message. In Era Bator Sur (Song of the Deserted Path), he told the story of vanishing folk cultures, while in Chikmik Bijuli (The Lightning), he looked at the transformation of Guwahati from a small town to a big city. In later years he was deeply concerned about the atmosphere of social unrest in Assam. He told me more than once that he wished people would understand and use the “power of the gaan” (songs) than the “power of the gun” to resolve problems. In fact, one of his unfulfilled dreams was to make a feature film on the urgency to forsake violence. Ignore, and be ignorant. Cinema from the Northeast has verve.